ALLRUSSIAS - "The Nationalities Question"
In Marxist teaching, “the nationalities question” played a subordinate role. Ethnic problems were considered to be a characteristic of the bourgeois capitalist world: as soon as capitalism gave way to socialism, all social roots of interethnic antagonisms would be eradicated and nations would come together in one supranational world community. In contrast to Marx, however, Lenin was aware of the revolutionary potential of the oppressed nationalities and was determined to use it. He referred to imperial Russia as “the prison of peoples” and incorporated the demand of the right of “national self-determination for all nations” into the first Bolshevik party program (1903). Still, for Lenin and his followers, class struggle took priority, and they were firmly convinced that national problems would resolve themselves automatically in a socialist Russia. Somehow, at a stroke, the tsarist empire would be transformed into a proletarian internationalist state and skip the stage of the development of national states. Following the October takeover, the Bolshevik government adopted the “Declaration of the Rights of the Peoples of Russia.” The declaration facilitated the acceptance of Soviet power on the multiethnic fringes of the disintegrating empire by promising its peoples “equality and sovereignty” and reaffirming “the right to free self-determination, up to secession.” Intoxicated with the idea of a world revolution and the “international solidarity of the proletariat,” the Bolshevik leadership did not seriously expect the working masses of the ethnic periphery to claim self-determination. The declaration of the right to self-determination in theory and its denial in practice would determine the fundamental ambiguity of the Soviet regime’s nationalities policy for many years to come. 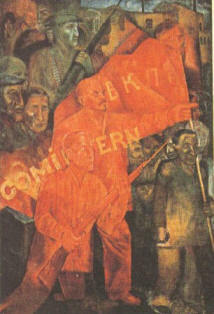 The new constitutional structure, set up by the Bolsheviks, made important concessions to the principle of nationality. In 1918 the former imperial core territories were proclaimed a federation, called the Russian Socialist Federated Soviet Republic. A number of separate republics also sprang up on the imperial fringes that had fallen off from the Russian center during the revolutionary upheaval. They were tied to Russia by military treaties and economic agreements, but they remained for some time formally independent.